It’s the birth date of H. A. Rey (1898-1977), Curious George Series. September has been designated Read a New Book Month. But for me, rereading a book I haven’t picked up for decades often seems like reading a new one. At the beginning of every school year, I ask my graduate students to talk about the book they most loved as a child. 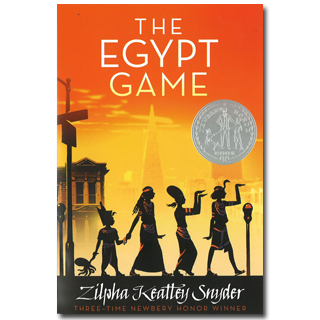 Zilpha Keatley Snyder’s The Egypt Game, originally published in 1967, almost half a century ago, frequently makes that list. I myself had not reread it for decades. And so, on a glorious August afternoon, I picked it up again. Sometimes realistic fiction ages badly, but such is not the case with The Egypt Game. In fact, in many ways it seems remarkably contemporary. Long before Rick Riordan published the Kane Chronicles, Zilpha Keatley Snyder made the world of Ancient Egypt come alive for young readers. In a university community, where children of mixed races play together and go to school together, April Hall finds herself living with a grandmother she doesn’t like while her fly-away-Mayzie mother jets around with a new boyfriend. April longs to go home to Hollywood and tries to show how glamorous she is, with fake eyelashes and a fur stole. But her neighbor, Melody, an African-American girl living in the grandmother’s apartment, sees through the disguise. The two, along with Melody’s four-year-old brother, begin to explore the neighborhood and discover an abandoned small lot. There with some props from home and a lot of imagination, they start to play the Egypt Game, imagining the rituals and activities of those in Ancient Egypt. Eventually three others, a Chinese girl and two boys, join them. But even in this community in the 1960s, evil lurks. After a child is kidnapped and killed, April, Melody, and their friends are kept inside for a period, eager to return to the game they all long to play. And then one night, April herself meets up with the killer. Many children encounter this book in school, because it works naturally with books about Egypt. It pairs well with David Macaulay’s Pyramid, particularly for those hunting for fiction/nonfiction combinations. Unlike most books of the 1960s, Zilpha Keatley Snyder does not dwell on the difference of racial backgrounds, but rather emphasizes the common ties of children engaged in imaginative play. And for those children being raised by a family member, rather than their biological parents, it paints a very positive picture of the strengths of a blended family. After reading The Egypt Game again, I understand why it has survived—and has remained in the memories of young readers—for almost half a century. There were dozens of children the neighborhood, boys and girls of every size and style and color, some of whom could speak more than one language when they wanted to. But in their schools and on the streets they all seemed to speak the same language and to have a number of things in common. And one of the things that they had in common, at that time, was a vague and mysterious fear of the old man called the Professor. Just what was so dangerous about the Professor was uncertain, like everything else about him, but his appearance undoubtedly had something to do with the rumors. He was tall and bent and his thin beard straggled up his cheeks like dry moss on gray rocks. Originally posted September 16, 2013. Updated for . I haven’t thought about this books in ages!! I think I read it 20 years ago. I remember bits and pieces of it, but now I’m itching to find a copy and re-experience it as an adult. I shamefully admit that I’m often guilty of judging children’s and YA books by their covers…and this one is VERY evocative. I love the art. Star: This cover is very attractive, a good modern update for the book.